Stunning original piece of contemporary jewelry ! Definitely the eye catching "best off" our collection ! 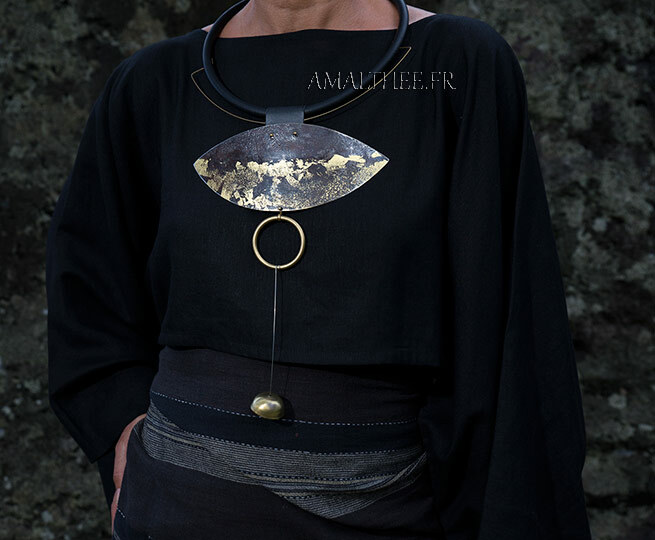 Bold yet super lightweight, this statement oxidized iron piece with gold leaf patina is truly a work of art...The delicate hand hammered (mute) brass "bell" swings gracefully when the body moves while the large ring stays firmly centered, a very smart closure allow to adjust the rubber choker. With such a piece, the question is : are you ready to show off your inner true singularity ?